Ear Bleeding and Pain | Do You Have a Ruptured Eardrum? Pain and bleeding from the ear can be caused by a perforated or ruptured eardrum. Ear discharge may be clear, bloody, or look like pus. While a ruptured eardrum will typically heal on its own, precautions must be taken to protect the inner ear and the healing membrane. Follow these steps to relieve the pain and to insure proper healing. Ear infections. One of the most common causes of a ruptured eardrum, an ear infection creates a pressure buildup in the middle ear, pushing against the eardrum. Poking the eardrum. Use of a foreign object such as a cotton swab is another common cause of a ruptured eardrum. When the object makes contact with the sensitive eardrum, it can cause a tear or other damage. Pressure changes. Unequal pressure inside and outside the ear can strain the eardrum and tear it. Drastic or sudden changes in pressure are painful and can cause symptoms like ear bleeding. Head injury or blow to the ear. A severe blow to the head or ear can rupture the eardrum. This is one common reason for helmets to be worn during potentially dangerous activities, such as playing sports or riding a bicycle. Acoustic trauma. Explosions or sudden blasts of loud music are painful and dangerous. Continued exposure to loud music can cause permanent hearing loss. People who have these additional symptoms should seek medical attention immediately at an emergency room. There is no specific treatment for a ruptured eardrum. They usually heal themselves within three months. Over-the-counter pain relievers can be taken to ease some of the symptoms. It is important that the eardrum be kept dry while it heals to avoid a middle-ear infection. FastMed Urgent Care can identify the cause of your ear pain and bleeding, and our medical professionals will quickly recommend remedies to relieve the pain. We are open seven days a week and have extended weekday hours for your convenience. 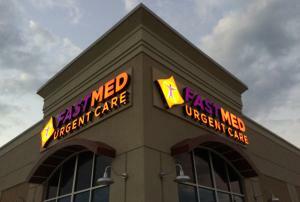 FastMed Urgent Care also accepts all major insurance plans, including Medicare and Medicaid so visit our Insurance page to confirm that your specific plan is accepted.